TSMS Admission Test 2019 certificates verification dates, schedule : List of Required Documents or Certificates for Telangana Model School Counselling Certificate Verification 2019. TSMS Admission Test 2019 Certificates Verification Dates, Telangana Model School 6th/ 7th Class Admission Counselling Dates/ certificate verification Schedule, 8th Class/ 9th Class Counselling Dates for TS Model School 8th Class Admission certificate verification dates for 9th Class and 10th Class Admissions in Telangana Model Schools 2019-20. Telangana Model School Admission for 6th/ 7th Class, 8th Class, 9th Class and 10th Class Entrance Test Conducted on 18-04-2019. Finalization of admission list at School level and Class wise display on -05-2019. Telangana Model School Admission Selected candidates certificate verification from -05-2019 to -05-2019. TS Model School Admission Test Certificate Verification Dates Download at telanganams.cgg.gov.in. 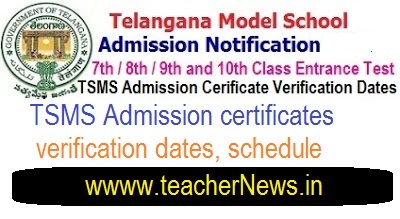 TSMS 6th/ 7th/ 8th/ 9th/ 10th Class Admission Certificate Verification, Telangana Model Schools Inter 1st year Admission Test 2019, TS Model School Counselling Schedule 2019, TSMS Admission Counselling Dates for 6th, 7th, 8th, 9th, 10th class, Inter 2019-20.